The festival is produced by composer Sid Peacock, whose Surge Orchestra is at the heart of the event and lends the play on words in its title. Working in partnership with the Birmingham City University festival industry initiative Grow Your Own, Peacock has attracted funding for Surge in Spring from Arts Council England, PRS For Music Foundation, Birmingham City University and mac Birmingham, and gathered the support of CHIME, Celebrating Sanctuary, Flatpack Film Festival, Jazzlines, TDE Promotions and Room Art. These nitty gritty details have allowed him to put together a programme – much of it free to encourage people to explore – that’s full of ambition, variety and exciting collaborations. The line-up of international musical influences and instrumentation in themselves are mouth-watering, with wind instruments including Arabic clarinet and ney and Chinese Dizi, a percussion section including Zimbabwean mbira, Guinea-Bissaun gumbe and Indian tabla (percussion), and vocals from the Democratic Republic of the Congo and Hip hop MC Juice Aleem just some of what’s on offer. This second instalment of the festival, which came together last year after Peacock met Nick Gebhardt, Professor of Jazz and Popular Music Studies at Birmingham City University and Grow Your Own initiator, is driven by Peacock’s desire to weave music, art, poetry and video from many different communities, genres and eras, and to deliver a powerful listening experience for everyone in the audience. Opening the festival in mac’s Main Theatre, one of the two new commissions, Rivers of Love sees Juice Aleem and Surge Orchestra combining to represent struggle, chaos, complexity and magical realism through lyrically intelligent rap set to musical exuberance. 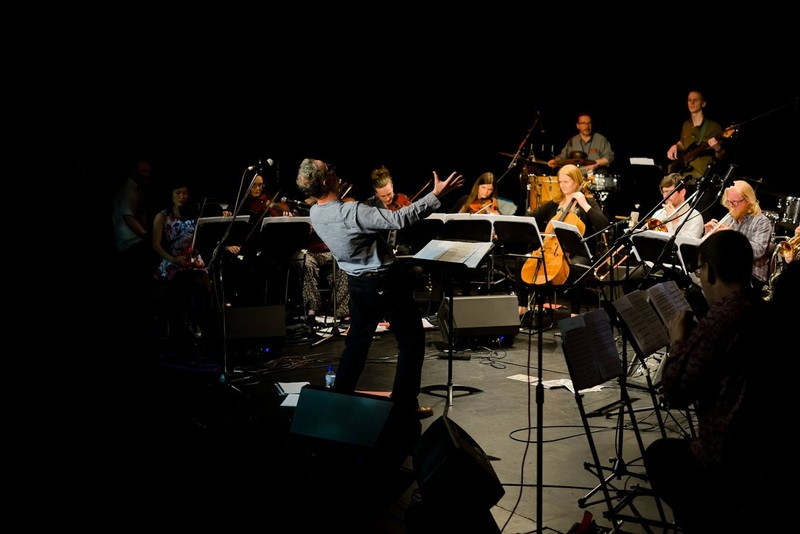 The second commission, also in the Main Theatre, features an ensemble co-led by drummer Mark Sanders and saxophonist Rachel Musson performing music that will include spoken word on the theme of American novelist and social critic James Baldwin declaimed by Debbie Sanders. Two free admission sessions in the Hexagon Theatre will highlight the experiences of women in Zimbabwe, feature a new collaboration between poet Liz Berry and pianist-improviser Steve Tromans and pitch Congolese vocalist Didier Kisala with English folk string quartet The Froe. The theatre also hosts a set of free improvisation from drummer Tymek Jozwiak’s group, a unique tablas-marimba collaboration and Chinese traditional music from the Jasmine Moon Duo. “There are also free sessions on the Terrace Gallery, further reflecting Birmingham’s exciting cosmopolitan make-up, before Palestinian composer, clarinettist & ney player Mohamed Najem & Friends bring the festival to a close with music that moves effortlessly between Arabic traditions and jazz,” says Peacock. As with last year’s inaugural Surge in Spring, there’s a strong sense of community running through the programme. For Peacock, to make contemporary music accessible to the wider public, the wider public has to feel involved.